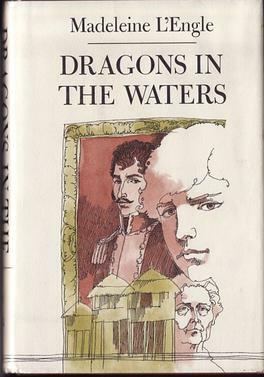 Dragons in the Waters was published in 1976, three years after A Wind in the Door. Though Poly O’Keefe, her brother Charles, and their father, Dr. O’Keefe, all have a role in the story, the protagonist is a young man named Simon Renier. Simon lives with his aging Aunt Leonis, who took him in after the death of his parents, but at the start of the story, he embarks upon a journey with Forsyth Phair, an apparent long lost cousin. Phair has purchased a valuable portrait of Simon Bolivar from Aunt Leonis, and in order to donate it to a museum, he and Simon must travel to Venezuela aboard a ship called the Orion. Though the other passengers on the Orion - including the O’Keefes - are nice people, Simon begins to feel uneasy as the journey begins. Cousin Forsyth is very cold toward him, and Poly and Charles both caution him against trusting the man. By the time the ship reaches port, someone will have tried to kill Simon, and Cousin Forsyth himself will be dead. In some ways, this book reads like a Nancy Drew Mystery. A bunch of interesting characters are thrown together in an exotic location and the reader, along with the amateur sleuth, must solve the case. But this book takes on so much more than the average murder mystery, after a while it becomes almost impossible to keep track of each thread of the story. Issues at play include Simon’s lineage and his connection to the Quiztano Indians of Dragonlake, a passenger’s gambling addiction, and another’s past as a smuggler, Charles’s ability to explore places in his dreams, Poly’s obsession with St. George and her hope that he will always be there to defeat dragons real and imaginary, Dr. O’Keefe’s desire to clean Dragonlake of poison, Aunt Leonis’s mortality, and on top of all those, the murder mystery itself. Some might argue that these many threads make the story more layered and more sophisticated, but instead they are just distracting. Characters like the O’Keefes, and Mr. Theo, and Canon Tallis seem randomly thrown into the story simply because they exist, and I’m not sure why this story couldn’t have been told from Simon’s point of view without any of them. Yes, fans like making connections between the books, but it’s not enough to just throw in a familiar character for the sake of name recognition. I felt like they needed stronger connections to the main plot. I continue to dislike Poly, who is so full of light and happiness she doesn’t seem real. What made her mother, Meg, so appealing in A Wrinkle in Time is her ordinariness, and her concerns about being ordinary. Her flaws become her strengths and make it possible for her to be a hero. Poly seems to have no flaws, and on top of that, she shows off and even brags about her specialness sometimes! And Charles is so much like Charles Wallace, but not as well-developed and therefore not as other-worldly or interesting. I keep waiting for her to do something that makes her feel more real, and more like a heroine, but she’s too good to be true. It also annoys me how little Meg and Calvin as adults resemble themselves as teens. Meg’s mother, Meg herself, and Mrs. Austin all seem interchangeable with one another, and Dr. O’Keefe and Mr. Austin may as well be the same character, as all they do is worry and talk about science. I think L’Engle’s strengths really lie in the science fiction arena. The Arm of the Starfish and Dragons in the Waters play at being suspenseful mystery novels, but they try to be too many other things as well. I liked many of the characters in this book - especially Simon and Aunt Leonis - but the story goes in so many directions, we never end up at a destination. Those reading the Murry/O’Keefe/Austin books in publication order, as I am, might not want to miss it, but on its own, I think Dragons in the Waters is kind of a disappointment for mystery readers and science fiction readers because it never fully becomes either one. I have similar complaints about Meg and Calvin as adults. =( Meg was perfectly recognisable in A Swiftly Tilting Planet, despite being a pregnant newlywed, but in this book there is nothing to indicate she was a heroine of the first three Kairos novels. When I raised this issue on my own blog, a commenter argued that since Madeleine L'Engle continued to write books for children even as she let her original protagonists age, she necessarily had to let them diminish so that their children could have a chance to shine. That doesn't make it any less disappointing, of course. If my own memory is any critic, Dragons in the Waters must be the most bland L'Engle novel I have ever read. I know I must have read it at least three times, but I can barely remember the plot! Nor do I have a good sense of Polly here, although I remember her quite vividly from A House Like a Lotus and vaguely from The Arm of the Starfish.